It’s that time of year again: Treasure Mapping time! This is when you can make use of the powerful first new moon of the astrological year to set your feng shui intentions for your life. For 2012 the Aries new moon falls on March 22 next week. 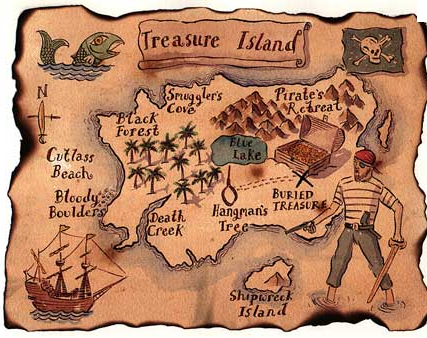 Tracy Abbott was my guest blogger and gave us detailed instructions on how to prepare for ==and make== a personal treasure map. Start at this post from year’s past and continue to part 2 at end. This is a pirate treasure map...click on the links above to see what creating your life on a personal treasure map might look like. I sure will!!! This is so cool! !